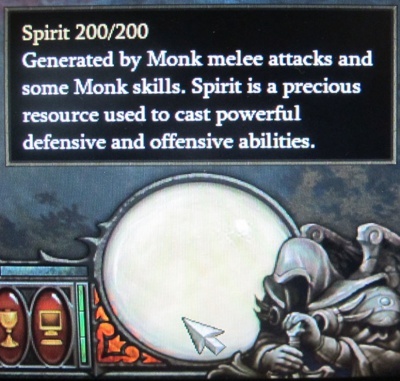 Spirit is the Monk's resource in Diablo III. It is generated by using Normal attacks and combo skills, and spent by using other skills. The resource was fully functional in the game as of Blizzcon 2010, and Spirit is often cited by the developers as their favorite of the various resources and the one they think is working the best. Jay Wilson: "The Monk has Spirit. That’s the resource we’re happiest with. He came together very quickly. His combo moves generate spirit, and that’s used for signature moves he does. He can’t do them very often. But they’re great attacks, escapes, and some are recovery moves. That one worked out really well." Spirit can be built up using the basic Attack skill, but it's recommended that players use the Monk's combo skills instead, since they have no cost to use and do a lot more damage, plus other effects. As seen in the Blizzcon 2010 demo, the combo skills added Spirit at a flat rate. For instance, each of the three hits that made up Hands of Lightning added 3 Spirit to the pool. The gain per combo use may be modified by other skills, passives, and item bonuses. The Guardian's Path: Spirit generation increased when using two-handed weapons. Transcendence: Every point of Spirit spent heals you. Chant of Resonance: While a Mantra is active, you gain spirit every second. Exalted Soul: Increases maximum spirit. Near Death Experience: When receiving a fatal blow, you're restored to 35% life and spirit. Spirit with tool tip. July 2011. Spirit is displayed in the right side resource globe as a billowing white gas, which builds as the Monk uses his combo moves. Using spirit skills such as Seven Sided Strike will deplete the built-up spirit. It looks like a liquid (milk) in still screenshots, but has a billowing, gaseous appearance in the game. This page was last edited on 29 May 2012, at 03:50.